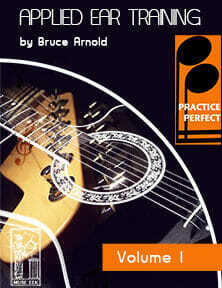 Practice Perfect™ Applied Ear Training Volume One Today! The musician who participates the Practice Perfect™ series MUST follow the directions for the proper use of the audio files. Each Movie Score Ear Training Track has three different audio files. These tracks use either a soprano, alto or tenor voice which sings the answer. Most of these Movie Score Ear Training Exercises are over a single harmony with a few exceptions. Some tracks have moving melodic lines which are usually more difficult for beginners but are excellent for intermediate to advance ear training students. All tracks are stylistically related to movie sound tracks with the vibe of action or suspense. b. Try practicing these Movie Score Ear Training Exercises with other musicians. c. Try practicing these Movie Score Ear Training Exercises in front of other people. d. Try practicing these Movie Score Ear Training Exercises at different times of the day. This entry was posted in Bass Guitarists and tagged Practice Perfect™, Applied Ear Training, Movie Score Ear Training by Muse Eek. Bookmark the permalink.